Frankfurt is a ceety in Germany, an the biggest ceety in the state o Hesse. 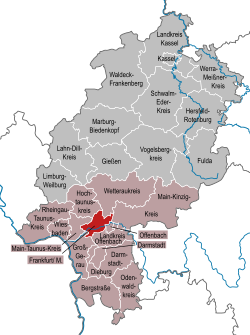 Frankfurt, thegither wi its suburbs, forms the Rhine-Main metropolitan aurie, wi a population jaloused tae be aboot 1.8 million (Frankfurt: 670,000 in 2008). Rhine-Main is ane o the lairgest metropolitan auries in Europe. The stock exchynge is ane o the lairgest in Europe (Frankfurt stock exchynge). This, thegither wi its financial an business sectors, haes turned Frankfurt intae ane o the major transportation naves o the warld. Frankfurt is listit as the fowert major global ceety.